As discussed before, pixels don't have a set size in the real world. When you set out to print an image on paper, GIMP needs to know how big each pixels is. We use a parameter called resolution to set the ratio between pixels and real-world units such as inches. By default, most images open with the resolution set to 72. This number was chosen for historical reasons as it was the resolution of screens in the past, and means that when printed, every pixel is 1/72 of an inch wide. When printing images are taken with modern digital cameras, this produces very large but chunky images with visible pixels. What we want to do is tell GIMP to print it with the size we have in mind, but not alter the pixel data so as not to lose quality. 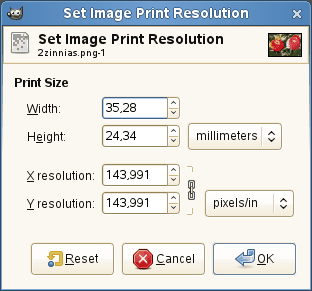 To change the print size use Image → Print Size to open the “Print Size” dialog. Select a size unit you are comfortable with, such as “inches”. Set one dimension, and let GIMP change the other one proportionally. Now examine the change in resolution. If the resolution is 300 pixels per Inch or over, the printed image's quality will be very high and pixels will not be noticeable. With a resolution of between 200 and 150 ppi, pixels will be somewhat noticeable, but the image will be fine as long as its not inspected too closely. Values lower than 100 are visibly coarse and should only be used for material that is seen from a distance, such as signs or large posters.